Welcome to Music Friday when we bring you fun songs with jewelry, gemstones or precious metals in the title or lyrics. Today, the heartthrob boy band NSYNC compares gemstones to a very special woman in 1999's "(God Must Have Spent) A Little More Time on You." They croon, "In all of creation, all things great and small / You are the one that surpasses them all / More precious than any diamond or pearl / They broke the mold when you came in this world." 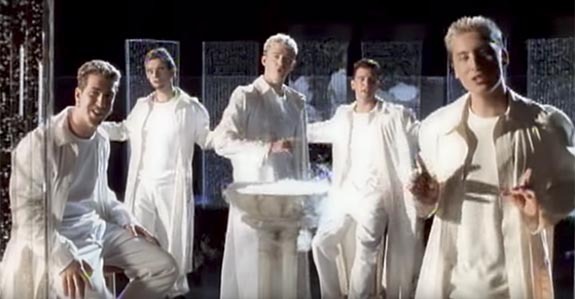 While teen girls worldwide stared at their NSYNC posters and dreamed that Justin Timberlake, JC Chasez, Chris Kirkpatrick, Joey Fatone and Lance Bass were singing about them, the official video for the song has the boys praising the virtues of a mom. Shot mostly in black and white, the video explores the powerful bond between a mother and son, from birth to old age. Released as the third single from their self-titled album, "(God Must Have Spent) A Little More Time on You" ascended to #8 on the U.S. Billboard Hot 100 chart and #3 on the Canada Top Singles list. The song, which was written by Evan Rogers and Carl Sturken, marked the first time NSYNC broke into the Top 10 of the Billboard Hot 100. The album was also a commercial success, topping out at #2 on the U.S. Billboard 200. The album remained in the Top 10 for 30 weeks. NSYNC was founded in Orlando, Fla., in 1995 as an alternative to the wildly popular Backstreet Boys. The group's all-caps name, sometimes depicted with a star before the first "N," seems to have two origin stories. Some have claimed that it is derived from a comment uttered by Timberlake's mom, who was impressed by how the boys' voices were "in sync." A second theory is that NSYNC represents the last letter in each member's first name. The second "N" apparently stands for the last letter in Lance Bass' nickname, Hansten. The star preceding the name was recommended by Israeli illusionist Uri Geller, who believed the symbol would bring them good fortune. At a cafe in London, Geller sat with the band members as he drew a star next to the word "NSYNC" on a napkin. "I told them, if they place that star on their first CD, they're going to shoot up to #1," Geller related to The Huffington Post in 2015. As noted earlier, Geller's prediction was nearly spot-on. The album peaked at #2. The group went on to sell 70 million albums and became one of the top-selling boy bands of all time. The group announced a "temporary hiatus" in 2002, and an official breakup was finally confirmed in 2007. Written by Carl Allen Sturken and Evan A. Rogers. Performed by NSYNC. Tell me, can this be real? How can I put into words what I feel? Why do I feel like I'm losing control? In 1926, at the age of 53, American tycoon Harrison Williams married Mona Bush, a divorcée 24 years his junior. Aboard his 250-foot yacht, the Warrior, the couple departed on a year-long, around-the-world honeymoon, and during a stopover in Sri Lanka (then Ceylon), the wealthiest man in America picked up a beautiful cornflower blue bauble for his new bride. That 98.57-carat cushion-cut gem, which is now known as the Bismarck Sapphire, is one of the world's finest examples of September's official birthstone. 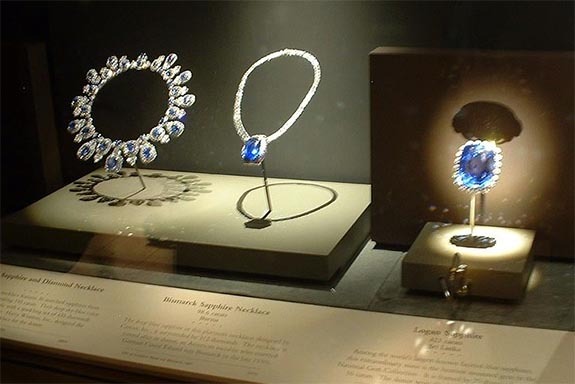 Visitors to the Gem Gallery at the National Museum of Natural History in Washington, D.C., will see the Bismarck Sapphire Necklace prominently displayed between two other famous sapphire pieces, the Hall Sapphire and Diamond Necklace and the Logan Sapphire. Originally set horizontally in a necklace designed by Cartier in 1927, the Bismarck Sapphire was rotated into a vertical position when Mona had the necklace updated in 1959. The necklace on display in Washington, D.C., is accented with eight square-cut blue sapphires and 312 baguette and round brilliant-cut diamonds. 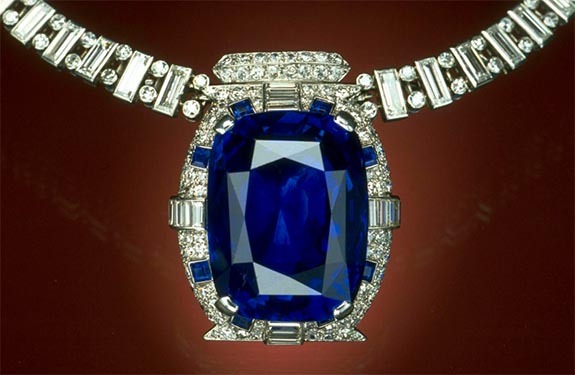 Gem experts believe that the Bismarck Sapphire was originally much larger than 98.57 carats and that it was likely recut by Cartier to attain optimum clarity and brilliance after returning to the states from Sri Lanka. Traditionally, Sri Lankan cutters favored carat weight over ideal proportions. With investments in public utilities, Williams had amassed a fortune estimated at $680 million (equivalent to about $9.6 billion today) — making him the richest man in America. But, the stock market crash of 1929 dissolved his fortune to a mere $5 million. Still, the Williamses maintained their ritzy lifestyle and, by 1933, Mona had earned the distinction of becoming the first American voted the "Best Dressed Woman in the World." Harrison Williams died in 1953, and two years later Mona would marry the German Count Eduard von Bismarck. At this point, the American socialite became known as Countess Mona von Bismarck. In 1967, at the age of 70, the Countess donated her beloved necklace to the Smithsonian. Mona died in 1983 at the age of 86. All sapphires are made of the mineral corundum (crystalline aluminum oxide). In its pure state, the corundum is colorless, but when trace elements are naturally introduced to the chemical composition, all the magic happens. Blue sapphires occur, for instance, when aluminum atoms are displaced with those of titanium and iron in the gem’s crystal lattice structure. Corundum has a hardness of 9 on the Mohs scale, compared to a diamond, which has a hardness of 10. Credits: Bismarck necklace photos by Chip Clark/Smithsonian. Smithsonian display by IFSconnie (Own work) [GFDL or CC BY-SA 3.0], via Wikimedia Commons. 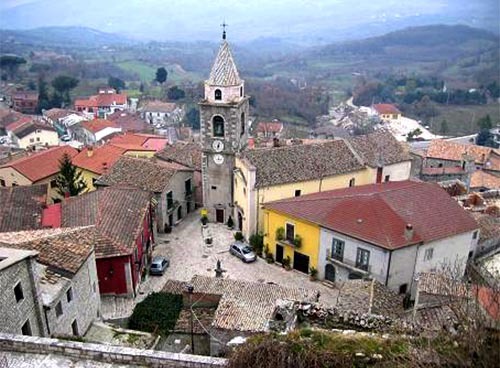 The picturesque town of San Marco dei Cavoti in southern Italy is now world famous for two things: 1) the delightful honey-and-nut confection known as torrone and 2) a diamond engagement ring that was miraculously liberated from a gap in one of its sidewalks — nine years after it was lost. 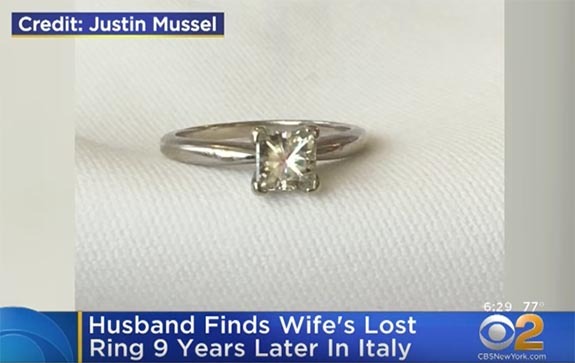 In the summer of 2008, New Jersey natives Margaret and Justin Mussel were staying with her parents in what may be the "sweetest" town in Italy when she noticed that her 1.1-carat diamond engagement ring was missing. 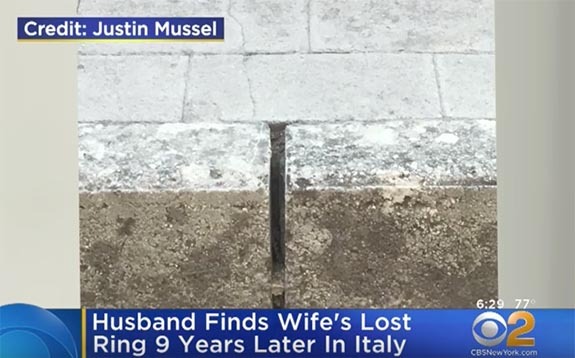 They had visited Pompeii earlier in the day, so they assumed the ring was lost somewhere along the 80-mile span between the ancient city and her mom's home. They searched the house and its surroundings, but the ring was nowhere to be found. Margaret remembered that the ring had been loose, but she wore it anyway. "I felt terrible, and I knew I should have probably taken it off," she told ABC. "I just felt really bad that I could have prevented it from falling off, and I kept it on that day." Worse yet, since the ring was lost on their trip abroad — and not in the U.S. — their insurance company would not replace it. 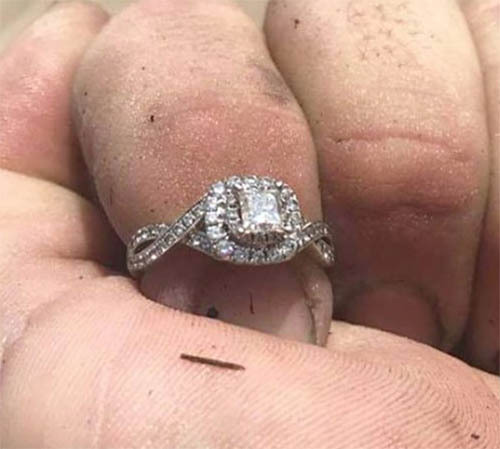 The heartbroken couple returned to Brick, N.J., with the understanding that the princess-cut diamond in the white gold four-prong setting was likely gone forever. Justin saved up for a few years and bought a replacement ring for Margaret. The lost ring slowly faded from their memories. That's until the couple returned to San Marco dei Cavoti a few weeks ago, with their two young boys. One evening, while lounging with his wife on his in-laws' front porch, Justin saw a brilliant reflection emanating from the sidewalk in front of the house. Each time a car would drive by with its headlights on, he saw a flicker. "I kept saying to Margaret, 'Do you see that? I see this glimmer coming out of the sidewalk," he told ABC. He thought the light might have been bouncing off a coin. Armed with a screwdriver, Justin tracked the reflection to a gap in the stones that bordered the sidewalk. He pried the shiny object that was jammed in the crevice, and what emerged was Margaret's ring. The precious metal was slightly scratched, but the diamond was in perfect condition. “I was like, ‘There's no way the ring is in there.' I couldn't believe it. I thought he was playing a joke,” she told ABC. "Never in my wildest dreams did I ever think we would find it again,” she added. “The odds of it falling into this crack, much less finding it nine years later, are astronomical,” Justin told the Asbury Park Press. Justin believes the ring must have bounced into the gap with the stone facing down. Over time, it had been covered in dirt, but enough of the diamond was exposed to reflect the beams from the cars' headlights. Margaret is now wearing her original engagement ring. The replacement ring will be for one of her boys when the time is right. Photos by Justin Mussel; Screen captures via YouTube.com/CBS New York. San Marco dei Cavoti photo by User: Pcocca Patrizia Cocca (Own work) [Public domain], via Wikimedia Commons. Millennial shoppers will have diamond jewelry on their minds this holiday season thanks, in part, to a huge marketing push by the De Beers Group, which is set to spend $140 million by the end of the year. The budget is its biggest since 2008. For those of you unfamiliar with De Beers, these are the same folks who introduced the world to "A Diamond Is Forever," a slogan penned by Frances Gerety, an NW Ayer copywriter, in 1947. That four-word tagline has inspired literature, music, a James Bond flick, and earned the title of the best advertising slogan of the 20th century by Advertising Age magazine. Today, the De Beers Group has grown into an international powerhouse representing the interests of diamond exploration, diamond mining, diamond retail, diamond trading and diamond manufacturing. Among its many responsibilities is elevating the position of diamonds in the hyper-competitive luxury goods market. “Total consumer expenditure on diamond jewelry for the last five years collectively has been the highest on record – and the outlook is positive," said Stephen Lussier, De Beers Group’s Executive Vice President of Marketing. "However, we cannot take future growth for granted." The $140 million budget will be used to boost diamond jewelry demand in leading global markets, with the biggest allocations earmarked for the U.S., China and India. De Beers will continue to be laser focused on the emerging millennial generation — those born between 1982–2004. “Increasing our spend from a strong position will help support continued demand in both mature and developing markets, particularly among millennials, who are already the largest group of diamond consumers despite this generation not having yet reached its maximum earning potential,” Lussier added. The Diamond Producers Association, which is responsible for the "Real Is Rare. Real Is a Diamond" TV commercials, has seen its 2017 budget quadruple, compared to 2016. According to bloomberg.com, the U.S. accounts for more than half of the world’s diamond purchases. Diamond sales in the U.S. reached $41 billion in 2016, an increase of 4.4% compared to 2015. 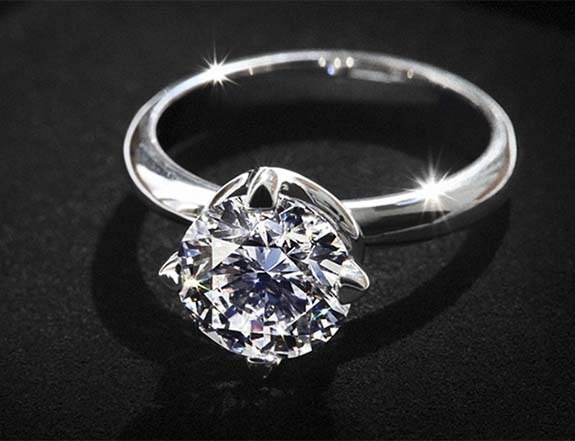 Credits: Ring image courtesy of De Beers Group. Screen capture via YouTube.com/Real is a Diamond. Welcome to Music Friday when we bring you awesome songs with jewelry, gemstones or precious metals in the lyrics or title. Today, Mark Knopfler scores a "beautiful find" in his 2006 release, "I Dug Up a Diamond." When taken literally, the song written by Knopfler is about a diamond miner who makes an unbelievable discovery. Metaphorically, "I Dug Up a Diamond" is about a man who's been on a seemingly hopeless search for the love of his life — and then finally finds her. He sings, "I dug up a diamond / Rare and fine / I dug up a diamond / In a deep dark mine / If only I could cling to / My beautiful find / I dug up a diamond / In a deep dark mine / My gem is special / Beyond all worth / As strong as any metal / Or stone in the earth." 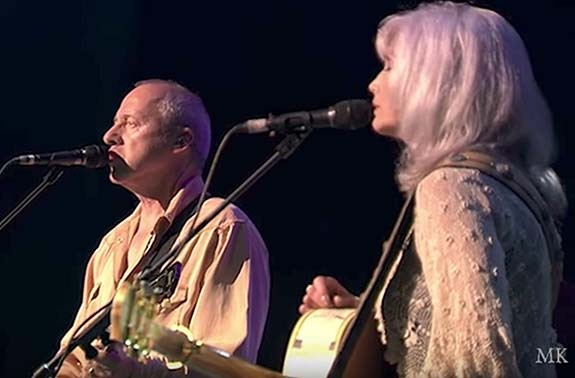 Providing the sweet harmonies for "I Dug Up a Diamond" is country legend Emmylou Harris. The pair had been friends since the late 1980s and decided to collaborate on an album, which they titled All the Roadrunning. Their work earned critical acclaim as the album peaked at #17 on the U.S. Billboard 200 chart. The 68-year-old Knopfler, who is best known as the frontman for Dire Straits, was born in Glasgow, Scotland, and grew up in Northumberland, England. Both are coal mining regions, so it is likely he drew his "I Dug Up a Diamond" lyrical inspiration from first-hand experiences. A four-time Grammy Award winner, Knopfler is ranked 27th on Rolling Stone's list of the 100 Greatest Guitarists of All Time. Knopfler and Dire Straits have sold more than 120 million records. Born in Birmingham, Ala., the 70-year-old Harris is a 13-time Grammy winner and a member of the Country Music Hall of Fame. She's collaborated with some of the music industry's biggest names, including Bob Dylan, Linda Ronstadt, Dolly Parton, Roy Orbison, Willie Nelson and Neil Young. "I Dug Up A Diamond"
Written by Mark Knopfler. Performed by Mark Knopfler and Emmylou Harris. Months ago, Tulsa native Russ Dugger scheduled a romantic vacation to scenic Key West, Fla., where he planned to surprise his girlfriend, Nadia Kyrylova, with a marriage proposal on the world famous beach. Little did he know that they'd be crossing paths with a Category 4 hurricane. The couple checked into their Key West hotel last Sunday, and Dugger was all set to pop the question on Wednesday with the assistance of the hotel staff. 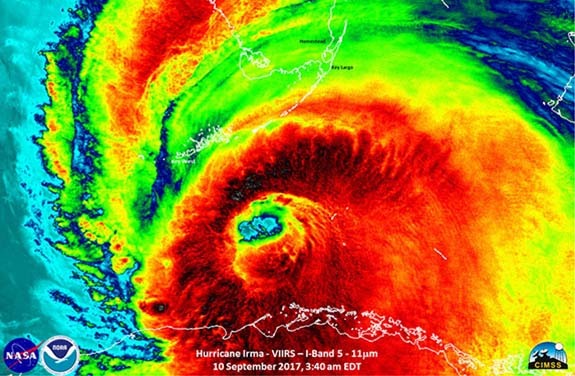 But, with Hurricane Irma predicted to make a hard, northward turn from Cuba toward the Florida Keys, hotel officials instructed the couple on Tuesday morning that they had to evacuate before Wednesday at noon. By Tuesday afternoon, Key West looked like a boarded-up ghost town, but Dugger wasn't going to let a hurricane stand in the way of his proposal. The couple had already survived a tornado together in Tulsa. Most of the hotel staff had already evacuated, so he would have to go it alone. 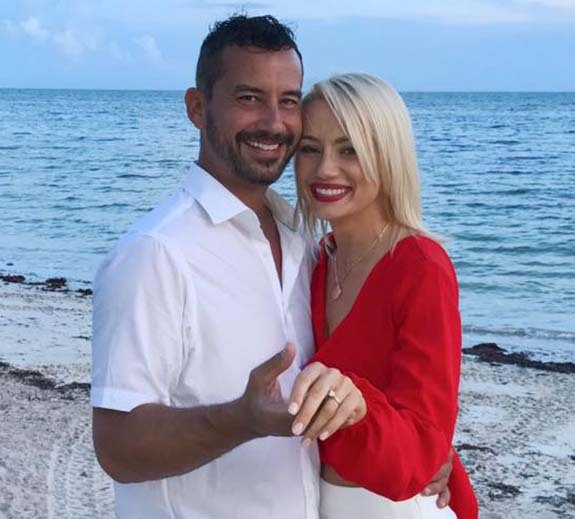 In a scene that could only be described as surreal, Dugger proposed to Kyrylova Tuesday afternoon on an impossibly deserted Key West beach. "Everybody was gone," Dugger told Tulsa's Fox affiliate Fox23. Kyrylova accepted Dugger's marriage proposal and a diamond engagement ring with a resounding "Yes." But, now the couple had to outrun one of the biggest and most powerful hurricanes to ever make landfall in the U.S.
On Wednesday, they hopped into their rented car and made the four-hour journey to Ft. Lauderdale airport. There, they waited for hours, hoping that their Fort Lauderdale-to-Dallas-to-Tulsa flight would be allowed to take off. By Thursday, they had finally arrived in Dallas, where they spent the night. 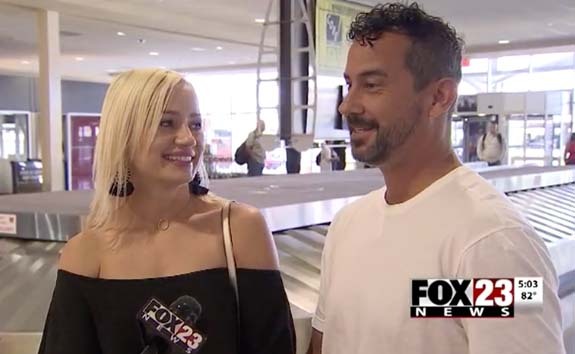 On early Friday morning, the exhausted, but relieved, couple was greeted by a Fox news crew at the baggage carousel at Tulsa International Airport. Dugger and Kyrylova will be able to tell future generations that their love was able to overcome two natural disasters — an Oklahoma tornado and a Florida hurricane. The couple plans to marry in Colorado in 2018. Credits: Beach photo via Facebook.com/russ.dugger.16; map via NASA/NOAA/UWM-CIMSS, William Straka; Airport screen capture via FOX23.com. Wildly divergent hues unbounded by traditional guidelines, seasonal borders or gender norms are the stars of Pantone's Fashion Color Trend Report for the spring of 2018. The "untypical" palette reflects the top 12 colors seen on the catwalks during NY Fashion Week, which concludes tomorrow in Manhattan. Pantone, the global color authority, publishes its report to give consumers and retailers a sneak peek at the color stories that will emerge in all areas of design and fashion in the coming year. Among 2018's "uplifting shades" and "feel-good tones" are Meadowlark, a confident and outgoing bright yellow, and Cherry Tomato, a tempestuous orangey red. Other favorites include Little Boy Blue, reminiscent of a clear blue sky; Chili Oil, an earthy brown-based red; Pink Lavender, a soft and romantic violet rose; and Arcadia, a cooler, cleaner take on green. In additional to the 12 "call-out shades," Pantone also revealed four "seasonal classics." These more subdued tones provide the mainstay of the wardrobe and the foundational core upon which consumers can start building their own personal style. Seasonal classics include the dark navy Sailor Blue, dove grey Harbor Mist, neutral Warm Sand and off-white Coconut Milk. In early December, we will announce Pantone's Color of the Year for 2018. Previous winners have included Greenery (2017), Rose Quartz/Serenity Blue (co-winners for 2016), Marsala (2015), Radiant Orchid (2014), Emerald (2013) and Tangerine Tango (2012). Credits: Images courtesy of Pantone. With his hands sweating and his heart thumping, Seth Dixon became an accidental media star early this week when he fumbled a diamond engagement ring through the planks of a wooden footbridge in Kansas City. 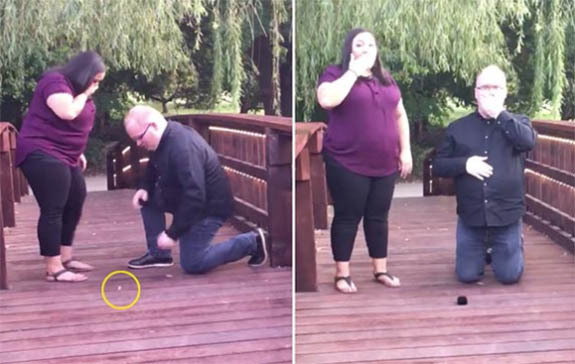 The 26-second video of a marriage proposal gone horribly wrong has caught the attention of major media outlets from coast to coast and around the globe. 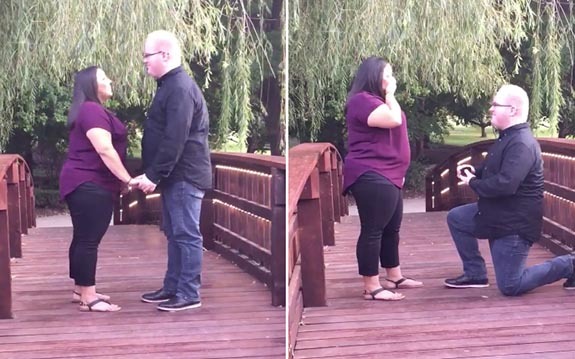 The Kansas City resident had planned to surprise his girlfriend, Ruth Marie Salas, by popping the question on Saturday at picturesque Loose Park. "I knew I wanted to propose [at Loose Park] just because it's kind of our spot," Dixon told local television station KSHB. "We just kind of fell in love with the park and the beauty of it." With a friend documenting the momentous event on her cell phone, Dixon went down on one knee at the crest of the bridge. The anxious suitor popped open the black ring box, but couldn't keep a grip on the engagement ring. 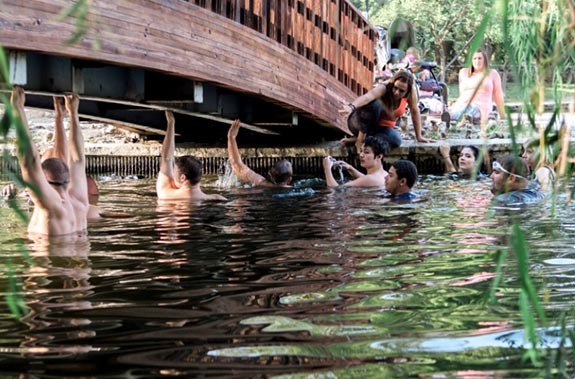 Dixon and Salas looked on in disbelief as the $4,000 diamond ring bounced twice on the bridge, disappeared through a gap between the boards and splashed into the pond below. Circled in the photo, above, is the ring just before it falls through the bridge. 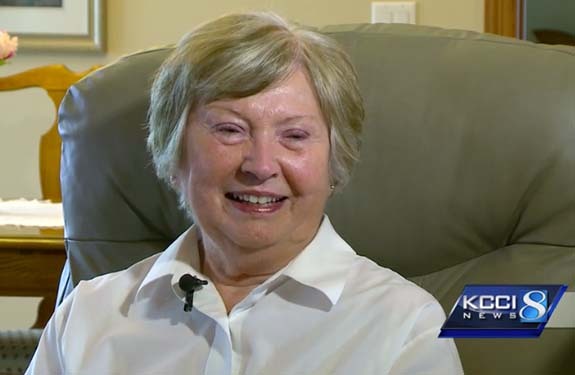 "It ping-ponged through the crack and I hear it plop in the water," Salas told KSHB. "I didn't know what else to think but, 'Oh my goodness.'" Dixon, Salas and the friend made an attempt to rescue the ring, but the poor visibility and deep silt made the search very difficult. They returned Sunday morning with a metal detector enthusiast, who came up empty because the water was too deep. At 11 a.m. the couple attended a church service and told the congregants from Lifegate Church in Independence about their plight. By 3 p.m., more than 25 friends from the church had donned goggles and swimming gear to join in the search. 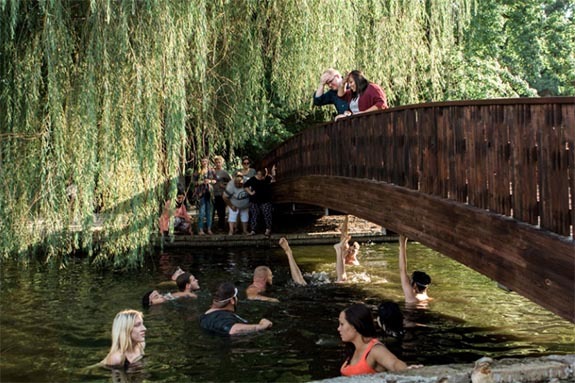 Fellow parishioner and professional wedding photographer Staci Dabney captured the water-bound excitement on Sunday. 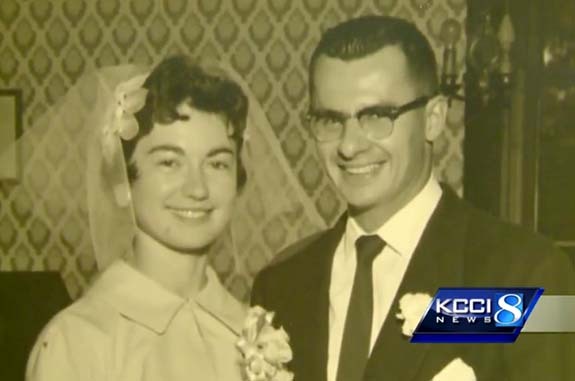 Despite the outpouring of love and support from the community, the ring could not be found. On Monday, a GoFundMe page was established on behalf of the couple. The funds were earmarked for a replacement ring, but by Tuesday afternoon, the campaign was marked completed after only $261 had been raised. It looks as if the viral video will be generating enough cash for the couple to purchase a new ring. Major media outlets will be paying a fee to use the video. As of today, the video was still available to view on the Facebook page of Staci Dabney's Photography. Click this link. The internet stars, who had been dating for four years, plan to wed October 21. Credits: Screen captures via Facebook.com/Staci Dabney's Photography. Photos courtesy of Staci Dabney Photography. Ancient Egyptians were captivated by gold. They considered gold "the skin of the gods" and associated it with eternity. They wore elaborate jewelry to enhance their beauty, indicate their social status and to express their spirituality. Egypt's connection with gold dates back more than 5,000 years, and the goldsmiths who worked with the precious metal were held in the highest regard. 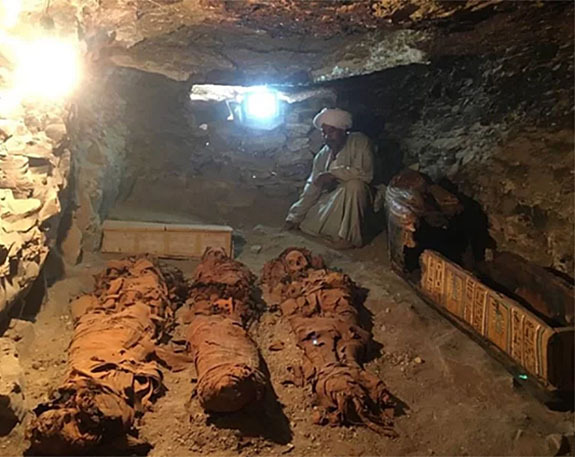 On Saturday, Dr. Khaled El-Enany of the Egyptian Antiquities Ministry announced the discovery of a 3,500-year-old tomb built for a prominent goldsmith named Amenemhat and his wife, Amenhotep. 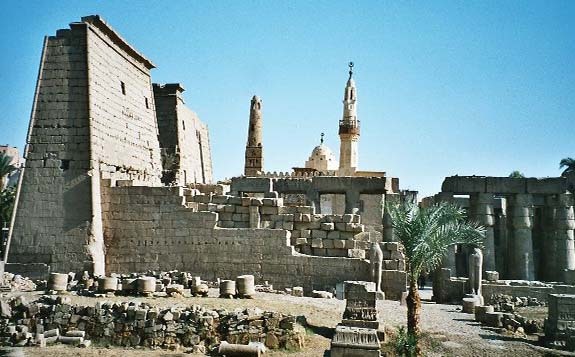 The tomb is located near the Nile River at the cemetery of Dra' Abu el-Naga in Luxor, an ancient city often characterized as the "world's greatest open-air museum." Hieroglyphic inscriptions found inside the tomb affirmed the name of its owner and his profession. Buried with their parents were two adult children. 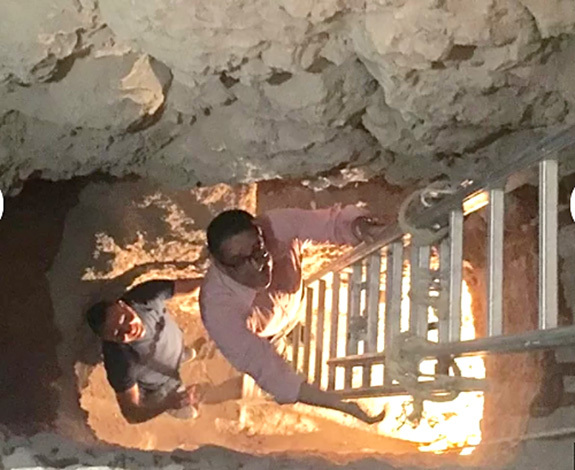 Archaeologists, led by Dr. Mostafa Waziri, Director General of Luxor, used a ladder to descend 20 feet into the tomb. 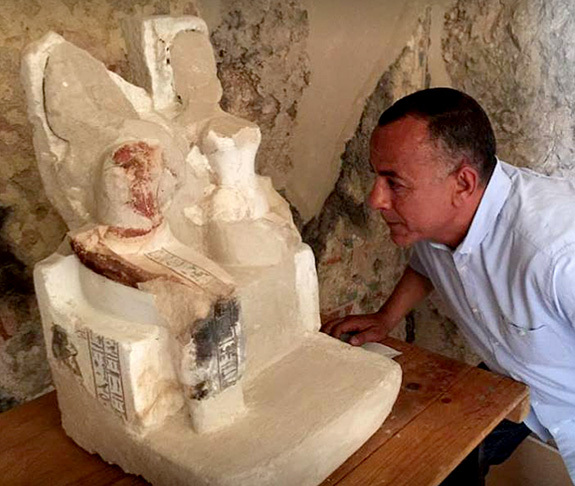 The entrance led to a square chamber, where a partly damaged sandstone statue depicted Amenemhat sitting in a high-back chair next to his wife, who is wearing a long dress and a wig. Between them, in a smaller scale, is a figure of one of their sons. Objects, such as gilded coffins, vessels, death masks, obelisks, statues — and jewelry — were often placed in Egyptian tombs to accompany the deceased to the afterlife. Amenemhat's tomb included jewelry, but the Egyptian Antiquities Ministry has yet to release photos of these items. Dr. El-Enany explained that the distinguished couple and their two sons lived in the 15th century B.C. Archaeologists believe that the tomb was also reused during the 11th and 10th centuries B.C. Ancient Egyptians' affinity for gold was bolstered by the vast natural resources that were being mined in Egypt's Eastern Desert and Nubia ("nub" is the Egyptian word for gold). Credit: Tomb photos courtesy of the Egyptian Antiquities Ministry; Luxor temple photo by Hajor, via Wikimedia Commons, released under cc.by.sa. Welcome to Music Friday when we often bring you inspirational songs with jewelry, gemstones or precious metals in the title or lyrics. Today, Christian hip-hop recording artist TobyMac collaborates with American Idol contestant Hollyn on "Lights Shine Bright," an uplifting tune about making the world a better place. In "Lights Shine Bright," TobyMac wants to "make this third rock glow" by magnifying God's light with the brilliance and intensity that only a perfectly cut diamond could achieve. He sings, "I wanna magnify Your light / I wanna reflect the sun / Cut like precious diamonds / With the colors by the millions." Written by David Garcia, Truett McKeehan and Solomon Olds, "Lights Shine Bright" was the fourth track from TobyMac's 2015 release, ***THIS IS NOT A TEST***. The album zoomed to #4 on the Billboard 200 and scored a Grammy Award for Best Contemporary Christian Music Album in 2016. 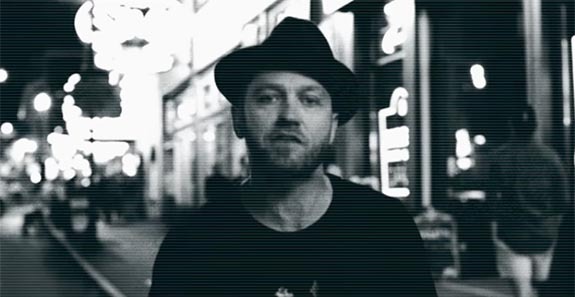 TobyMac's official website explains that the songs on the album provide an essential reminder that "we only have one shot at life." "Lights Shine Bright" features the vocal stylings of music-industry newcomer Hollyn, who is best known for her successful run on American Idol during Season 12. A native of Waverly, Ohio, the 20-year-old, whose birth name is Holly Marie Miller, released an album this year called One-Way Conversations. Born Kevin Michael McKeehan in Fairfax, Va., in 1964, TobyMac has sold more than 11 million records and has earned seven Grammy Awards. He first came on the Christian music scene in 1987 as a member of the vocal trio DC Talk. In 2000, the group announced a hiatus and TobyMac embarked on what has been a successful solo career. Written by David Garcia, McKeehan, Truett McKeehan and Solomon Olds. Performed by TobyMac, featuring Hollyn. 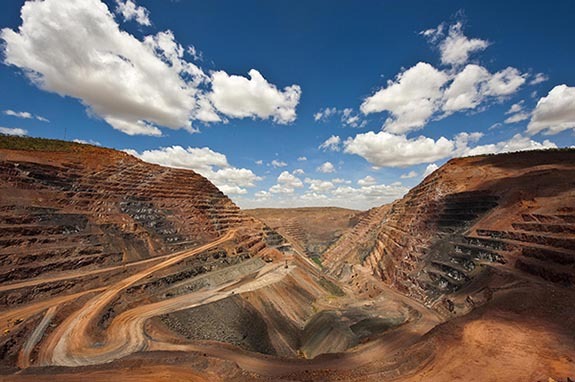 Rio Tinto's Argyle Mine in Western Australia — the world's most prolific diamond mine and primary source for pink, red and blue diamonds — is nearly tapped out. The mine is expected to cease operations in 2021 after a 38-year run that has produced more than 800 million carats of rough diamonds. While the bulk of Argyle's yearly output is brown in color, a minute segment of the production represents fancy-color diamonds so rare and so valuable that only 16 people in the world are permitted to touch them. According to a recent article in The Western Australian, Rio Tinto has 50,000 employees worldwide and not even its London-based CEO, Jean-Sebastien Jacques, is allowed handle the 58 diamonds that make up the 2017 Argyle Pink Diamonds Tender. The 2017 Tender is currently on a multi-city tour that started in Perth, traveled to Hong Kong and will end in New York. At each stop, top buyers are being invited to view the collection and put their secret bids into sealed envelopes. Bidding ends on October 11 and winners will be announced shortly thereafter. The headliner of the 2017 Tender is a fancy red diamond called the Argyle Everglow. The 2.11-carat, VS2-clarity, radiant-cut diamond was given this name because it seemed to possess an inner glow. The magnificent diamond, which could sell for upwards of $10 million, was cut from a 4.38-carat rough diamond discovered in the fall of 2016. It is the first 2-carat-plus fancy red diamond ever offered by Rio Tinto. 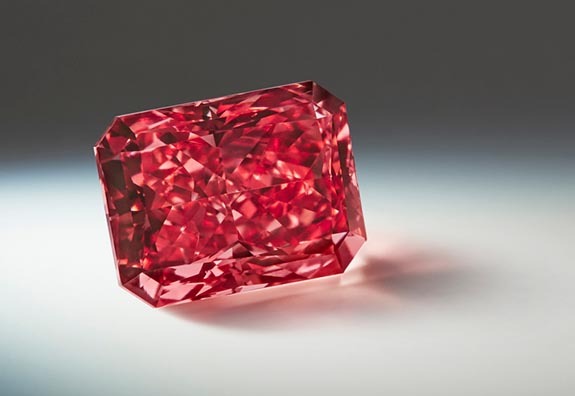 Red diamonds are so rare that in the 33-year history of the Argyle Pink Diamonds Tender there have been fewer than 20 carats of fancy red certified diamonds sold. Rio Tinto's Argyle mine is currently the largest diamond producer in the world by volume and accounts for 90% of the world's pink diamonds. Once shuttered, the world's annual supply of fancy-colored pinks, reds and blues are expected to diminish, forcing prices sky high. If the Argyle Everglow earns a $10 million bid, it will set a record for the highest price ever paid per carat for a gemstone. The current record is held by the 12.03-carat Blue Moon of Josephine, which sold for $48.4 million, or a bit over $4 million per carat. It is believed that red diamonds get their rich color from a molecular structure distortion that occurs as the jewel forms in the earth’s crust. By contrast, other colored diamonds get their color from trace elements, such as boron (yielding a blue diamond) or nitrogen (yielding yellow), in their chemical composition. 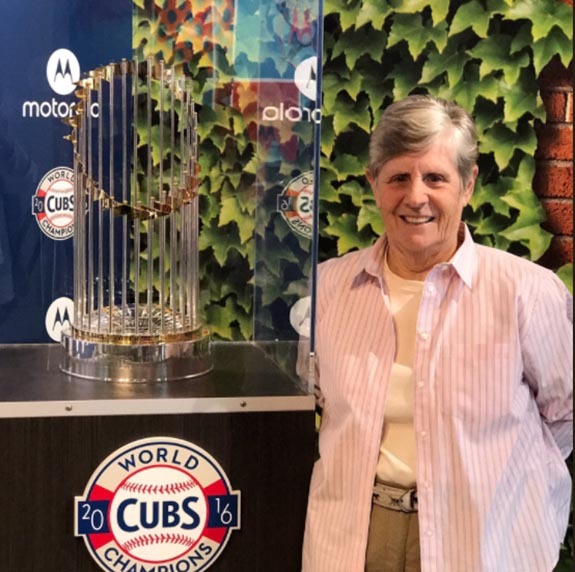 Geneine Dietz, a lifelong Cubs fan who spent 10 seasons ushering games at Wrigley Field, plunked down $10 on a raffle ticket and scored an authentic, player-grade 2016 World Series ring valued at $70,000. Dietz's winning ticket — #001907 — was drawn randomly from more than 25,000 entries. Fans paid $10 per entry to have a chance to win a Cubs championship ring that boasts 5.5 carats of diamonds, 3 carats of genuine Burmese rubies and 2.5 carats of genuine sapphires in a handsome red, white and blue design. Ironically (and somewhat eerily), the winning ticket number matches the year the Cubs won their first World Series. The club also won in 1908, and then suffered through a championship draught that lasted an agonizing 108 years. The number "108" was so significant that Jostens designed the 14-karat white gold ring with a slew of symbolic elements, including 108 diamonds surrounding the bezel on all sides. A photo of Dietz provided by the Cubs, shows the dedicated fan trying on her enormous ring. It's probably fair to say she won't be wearing it around the house. During the 2016 World Series, the Cubs defeated the Cleveland Indians in seven games after coming back from a 3-1 deficit. The final game went into extra innings, but the Cubs prevailed 8-7. When the 2016 World Series rings were originally revealed at the start of this year's baseball season, a Jostens vice president noted that the company had the responsibility to create a once-in-a-lifetime ring for the Cubs organization. 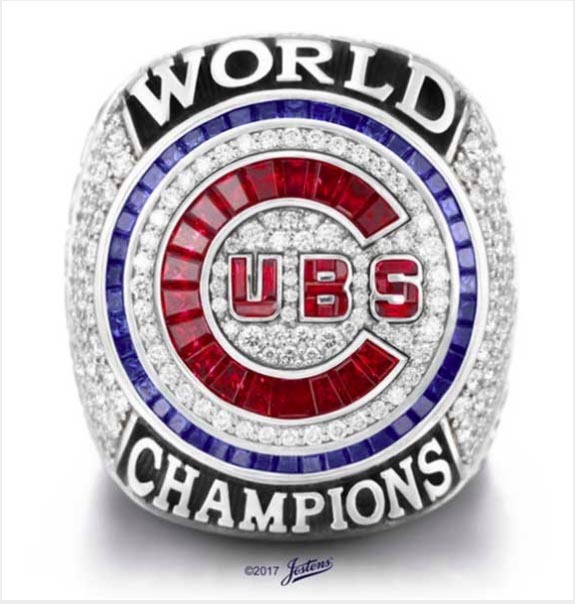 “This iconic piece of jewelry uses intricate craftsmanship to tell the unforgettable story of the Cubs’ World Series victory, which now takes its prominent place in the history of all professional sports," said Chris Poitras, Jostens Division Vice President, College & Sports. The World Series ring raffle, which ran from July 7 through September 4, generated more than a quarter-million-dollars for Cubs Charities. The charities are dedicated to improving the lives of children and families across Chicago and beyond. They provide increased access to sports opportunities and target improvements in health, fitness and education for those at risk. Credits: Geneine Dietz images via Twitter.com/Chicago Cubs; Ring image courtesy of Jostens. 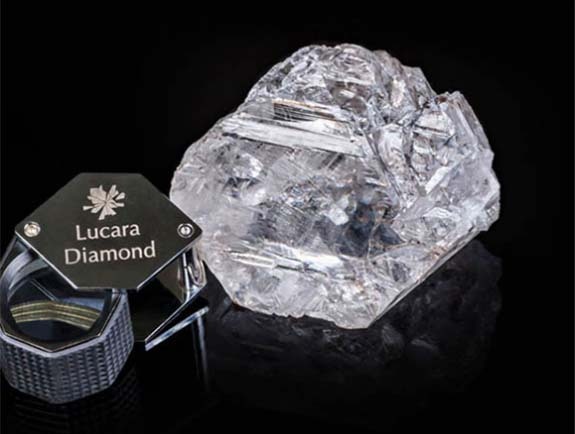 In mid-November 2015 — during a span of just 72 hours — Lucara's Karowe Mine in Botswana yielded three exceptional rough diamonds that tipped the scales at a combined 2,296 carats. Now, the government of Botswana wants first dibs on future historic finds. A new clause in Botswana's Precious and Semi-Precious Stones Act compels mining companies to notify the minister within 30 days of coming into possession of an "unusual" rough or uncut diamond. The country's chief mineral officer said that a diamond "outlier" may be considered "unusual" if it demonstrates extraordinary size, quality or color. The chief mineral officer told BusinessWeek that the government wanted an opportunity to celebrate as national treasures the museum-quality diamonds sourced at Botswana's mines. Even though the Karowe Mine is 100% owned by Vancouver-based Lucara Diamond Corp. through its Boteti Mining subsidiary, the government of Botswana will have the right of first refusal on "unusual" diamonds. Purchases of rough diamonds would be made in accordance with the current market price. Interpreting the market price of enormous gem-quality rough diamonds is not an easy task. For instance, the largest of the three diamonds discovered in November 2015 still doesn't have a clear value. Named Lesedi la Rona, the Type IIa diamond weighed a spectacular 1,109 carats, making it the second-largest gem-quality rough diamond ever discovered. Lucara decided to circumvent normal diamond-trading channels and put the gem up for bid at Sotheby's in 2016. After the diamond failed to meet the $70 million reserve price (bidding stalled at $61 million), Lucara wondered out loud if the stone was just too big to sell. Today, it remains unsold, and Lucara has seriously considered slicing the mammoth stone into smaller segments. Buyers have been apprehensive to make a play for Lesedi la Rona because of the enormous investment and lack of guarantees. Cutting a 1,109-carat diamond is uncharted territory, fraught with risks. 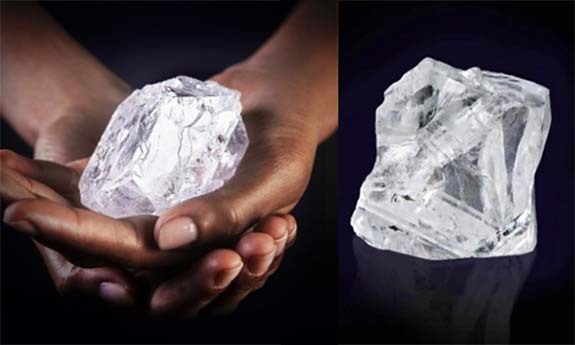 Lesedi la Rona's stablemates — the 813-carat “Constellation” and the 374-carat shard that broke off from Lesedi la Rona — were sold for $63 million and $17.5 million, respectively. With Lucara employing new large diamond recovery (LDR) equipment and X-ray transmissive technology (XRT), the unveiling of the next massive rough diamond could be right around the corner. Under the new rules, Botswana will get first dibs. Credits: Images courtesy of Lucara Diamond. 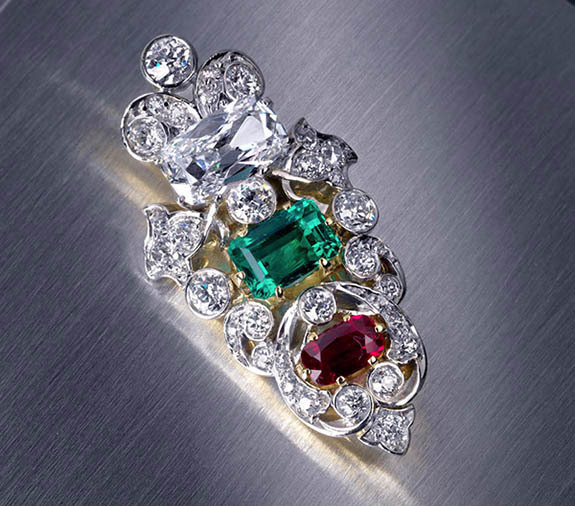 A sparkly red, white and green brooch that was scooped up for just $8 at an Ohio garage sale five years ago delivered a $26,250 windfall at Bonhams New York on Tuesday. Although the brooch was hardly the highest priced lot of the Bonhams auction, the feel-good It Could Happen to You narrative behind the piece made it the most intriguing. According to the auction house, the owner had presumed the brooch she bought at a garage sale was costume jewelry and gave it to her daughter to wear for church. The daughter reluctantly accepted the gift and placed it at the bottom of her purse, where it remained forgotten for months. 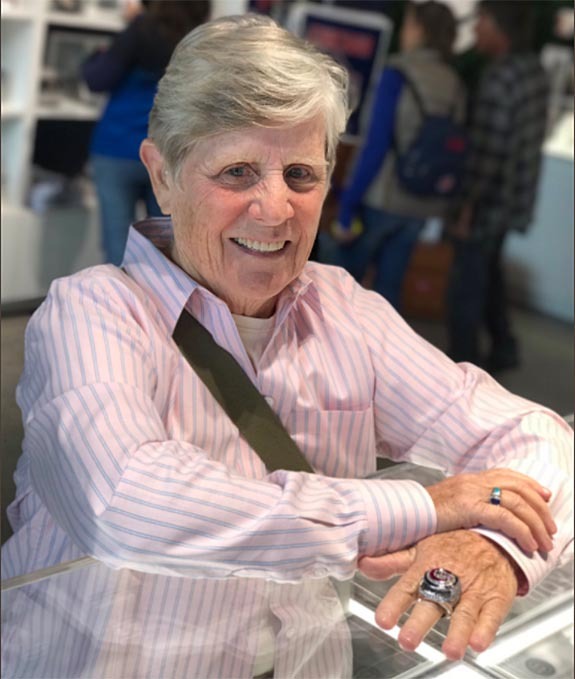 During a chance visit with her local jeweler, the young woman pulled out the brooch and shared the story of how she acquired it. The jeweler inspected the piece and revealed the unexpected news that the piece was very real. When approached with the $8 brooch, Abeles and her team of jewelry experts immediately sent the stones to the Gemological Institute of America to be tested. Results confirmed that the three primary gems in the piece were not only genuine, but were of gem quality. 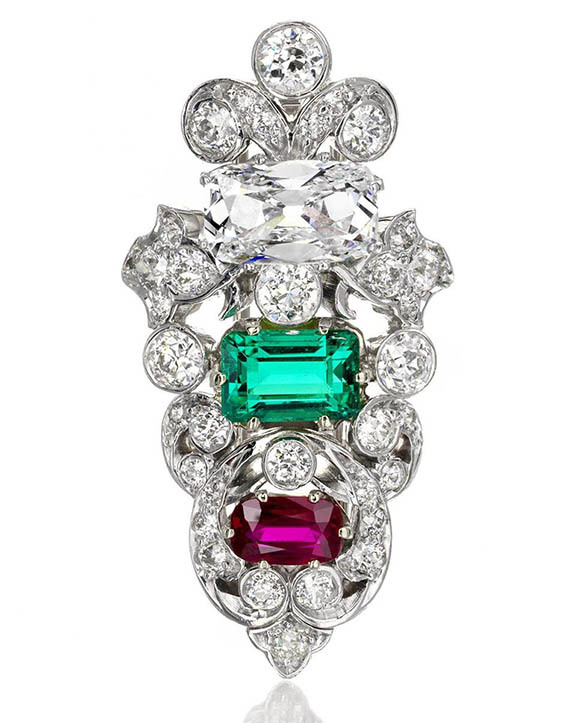 Near the top of the brooch is a 1.39-carat old mine-cut diamond that boasts a D color, VS1 clarity and Type IIa purity. The 1.50-carat rectangular-shaped emerald was of Colombian origin and the 0.60-carat oval-shaped ruby was determined to be of Burmese origin. Old mine-cut diamonds were common in the 19th century and featured a smaller table and larger culet (the small flat surface at the bottom of a diamond) than modern brilliant-cut diamonds. The gems are set in an openwork stylized shield design (circa 1900), which is crafted from platinum and 14-karat gold. The piece is accented with smaller old European-cut diamonds. Bonhams set the pre-auction estimate at $20,000 to $30,000. “Discoveries like these don’t happen very often, so we were delighted to offer this at auction where the actual value of the piece was finally realized,” Abeles told Forbes.com. Credits: Images courtesy of Bonhams.com. Hey, it's Music Friday when we bring you awesome songs with jewelry, gemstones or precious metals in the title or lyrics. When "Something Just Like This" was released earlier this year, the lyric video set a YouTube record with more than 9 million views in 24 hours. To date, that video has been seen an astonishing 686 million times. A collaboration of The Chainsmokers and Coldplay, "Something Just Like This" uses a precious metal reference to tell the story of a young man who discovers that he doesn't have to possess superhuman qualities to get a shot at true love. In the first verse, Coldplay's frontman Chris Martin compares himself to legendary heroes and faces the harsh reality that he doesn't stack up. He sings, "I've been reading books of old / The legends and the myths / Achilles and his gold / Hercules and his gifts / Spiderman's control / And Batman with his fists / And clearly I don't see myself upon that list." Fortunately for him, his girlfriend is logical, level-headed and more realistic about what is really important in a relationship. Martin sings her response, "I'm not looking for somebody / With some superhuman gifts / Some superhero / Some fairytale bliss / Just something I can turn to / Somebody I can kiss / I want something just like this." Written by members of both The Chainsmokers and Coldplay, "Something Just Like This" became an international sensation when it was released in February of 2017. The song charted in 38 countries, and topped out in #3 spots on both the U.S. Billboard Hot 100 and the Canadian Hot 100 lists. Andrew Taggart of The Chainsmokers told New Musical Express (NME) how the song magically came together during a studio session. "We found some chords that everyone loved and then Chris plugged a mic into the PA in the studio and freestyled for an hour. This song was the result," Taggart said. "We've never seen a song written in such a stream of conscious. It's hard to maintain your identity when working with such an established artist, but we feel this song is a great balance between both us and Coldplay." The song was released by both bands. It was the second single from The Chainsmokers' debut album Memories... Do Not Open. 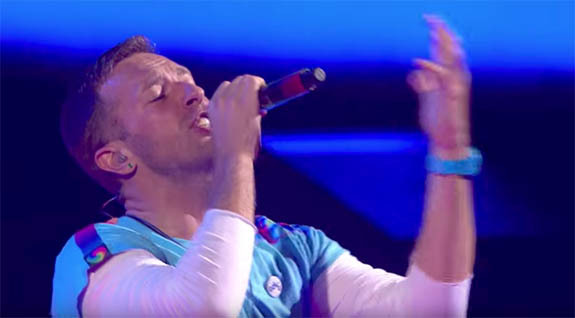 A live version, recorded in Tokyo, appeared as the first single from Coldplay's Kaleidoscope EP. Written by Andrew Taggart, Guy Berryman, Chris Martin, Jonny Buckland and Will Champion. Performed by The Chainsmokers & Coldplay. But she said, where'd you wanna go? She said, where'd you wanna go? The forlorn boyfriend who famously fumbled an engagement ring into the pond at Kansas City's Loose Park earned a redo on ABC's Jimmy Kimmel Live! on Tuesday. 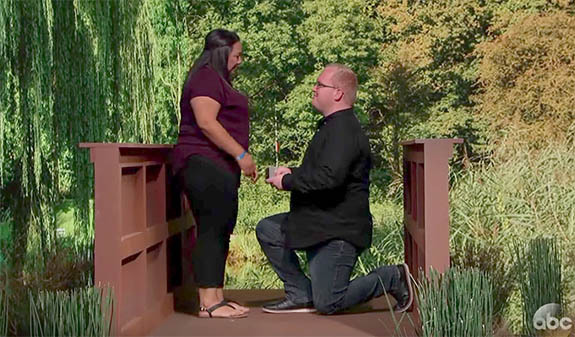 Seth Dixon got to propose to Ruth Salas in front of a national TV audience on a set that mimicked the wooden footbridge where the original proposal took place. The redo came as a complete surprise for the couple, who thought that they were being invited to Los Angeles by ABC to be interviewed on 20/20. 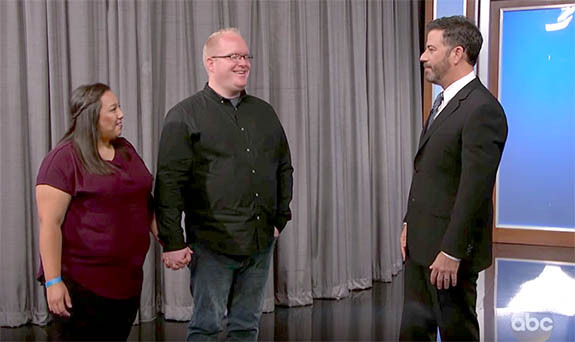 That all was a ruse to get the couple to attend the taping of Jimmy Kimmel Live!, where the host invited them onto the stage. 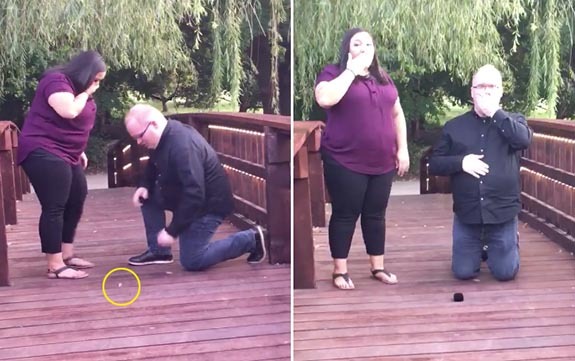 He recounted their story and showed the original "oops" video, where — in mid proposal — the engagement ring flies out of the ring box, bounces on the bridge decking and falls through the slats into the murky pond below. Despite the valiant efforts of the couple and many friends, the ring could not be found. The video went viral and triggered scads of proposal-gone-wrong headlines around the world. Kimmel didn't only provide the venue for the high-profile redo, but also made sure the couple had a new engagement ring. The ring, presented by celebrity jeweler Neil Lane, featured an oval-cut center stone accented by 100 smaller diamonds in a halo setting. Dixon's redo proposal went off without a hitch. Then it got down on one knee. What the ABC studio audience didn't know at the time of the taping was that back at Loose Park in Kansas City, metal-detector enthusiast Michael Long had successfully pulled the original ring from the mucky bottom of the pond. The resident of Springfield, Mo., had seen the couple's viral video on Facebook and made the 170-mile trip to Loose Park three separate times to dive for the ring. “I wanted to make sure they got it back before somebody else found it and had the opportunity to not give it back,” Long told Kansas City TV station KSHB. Dixon, an Uber driver, and Salas, a substitute teacher, got word of the good news while they were in California and told the producers of 20/20 that the ring was found. "Throughout the week, we [had] been in constant communication with 20/20 and they have been made aware that we found the ring, but it wasn't in our possession yet," he wrote. "We have been completely honest with them during this entire process. Even with them knowing everything, they still decided to bless us with a new ring. After the show, we again mentioned the ring situation. They again said they wanted us to keep the new ring! All of the staff at Jimmy Kimmel Live! have been AMAZING and we are so thankful for them! They have been nothing but a blessing to us!" Dixon also acknowledged the kindness and tireless efforts of a complete stranger. "A BIG THANKS to Michael Long for offering his services to help us find the original ring!" he wrote. "We truly appreciate you going out of your way to find our ring and returning it to us. Many people searched for the ring, but you are the one who found it. We greatly appreciate your service! We recommend Michael to everyone as a professional treasure hunter! Thank you again!" The couple plans to wed on October 21 and it's still not clear whether Salas will be wearing the original ring or the new one provided by the show. Check out the video of Dixon's "redo" proposal on Jimmy Kimmel Live!. And, yes, Dixon and Salas happen to be wearing the same outfits (right down to the shoes) from the original "oops" video. Screen captures via YouTube.com/Jimmy Kimmel Live!, Facebook.com/Staci Dabney’s Photography. Recovered ring via Facebook/Seth Dixon. 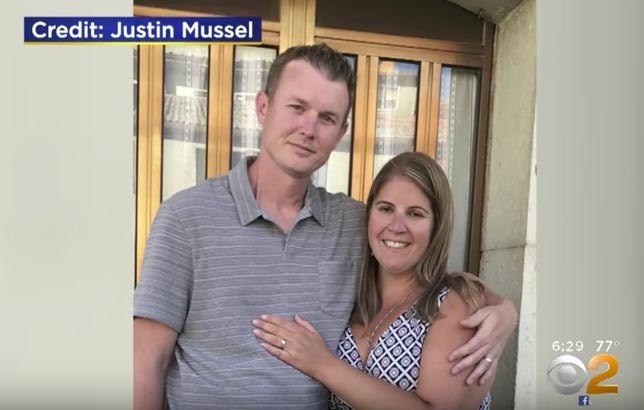 A police officer with a heart of gold searched the breakdown lane of Route 4 in New Jersey — on his own time — to find the engagement ring of a young bride-to-be. Kimberly Garcia had lost her ring while changing a flat tire on the side of the busy highway in northern New Jersey, but didn't realize it had slipped off until she got home on Sunday. The distraught 27-year-old, whose wedding is set for August 2018, filed a report with the Paramus Police Department and returned to the scene the same day with a group of officers. Despite their best efforts, they were unable to find the ring. Obviously moved by Garcia's plight, Officer Jon Henderson was not ready to give up the search. On Monday, he returned to Route 4 during his free patrol time and meticulously scoured the breakdown lane where Garcia had been. Before long, the officer had successfully located the ring and returned it to an ever-grateful Garcia. The Paramus Police Department posted a photo of the officer and Garcia, whose brilliant smile reflects just how happy she is to have her engagement ring back on her finger. 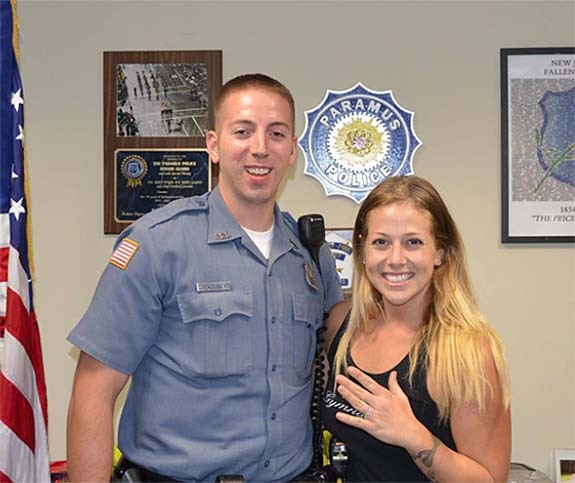 The caption reads, in part, "The Paramus Police Department is ecstatic that Officer Jon Henderson was able to recover the lost engagement ring of Kimberly Garcia." The post earned 1,300 Likes, 113 Comments and 43 Shares on Facebook. Noted Facebook user Don Pierce, "Awesome job! No surprise here. Paramus PD is a class outfit." Added Michael Dalton, "Excellent job!! Way to go above & beyond!!" Bringing an amusing perspective to the story was Chris Balutis, who wrote, "I don't know which is more impressive. That he took the extra time to locate her ring or that she was changing her own flat on the side of Route 4!" Credit: Image courtesy of Paramus Police Department. British billionaire and diamantaire Laurence Graff paid $53 million for the 1,109-carat Lesedi La Rona, the largest gem-quality rough diamond discovered in more than a century. Graff's purchase marks the poignant reunion of two of the world's largest and most high-profile diamonds. You see, Graff had already paid $17.5 million for the 373.72-carat "chunk" that fractured from her sibling during the mining process. Lucara Diamond Corp. and Graff closed the deal with a handshake after more than a year of negotiations. The 79-year-old founder of Graff Diamonds had purchased Lesedi La Rona's smaller sibling at Lucara’s Exceptional Stone Tender in May. That price was $46,827 per carat, just slightly lower than the $47,777 per-carat price paid for Lesedi La Rona. “We are thrilled and honored to become the new custodians of this incredible diamond," noted Graff in a statement. "Our highly skilled team of master craftsmen will draw on many years of experience of crafting the most important diamonds, working night and day to ensure that we do justice to this remarkable gift from Mother Nature." What the tennis-ball-sized Lesedi La Rona will ultimately yield after the cutting and polishing process is still a mystery. "The stone will tell us its story. It will dictate how it wants to be cut and we will take the utmost care to respect its exceptional properties," Graff added. "This is a momentous day in my career, and I am privileged to be given the opportunity to honor the magnificent natural beauty of the Lesedi La Rona." 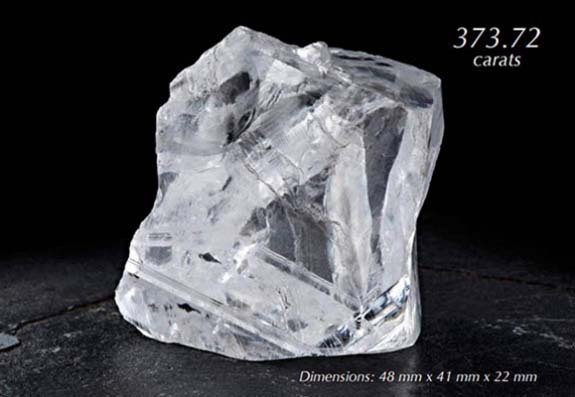 The largest gem-quality rough diamond of all time is the 3,106-carat Cullinan Diamond. It was discovered in South Africa in 1905 and eventually cut into nine major pieces and 96 smaller brilliant-cut diamonds. The largest of the polished diamonds, the Great Star of Africa, weighed 530.4 carats and is now part of the British Crown Jewels. 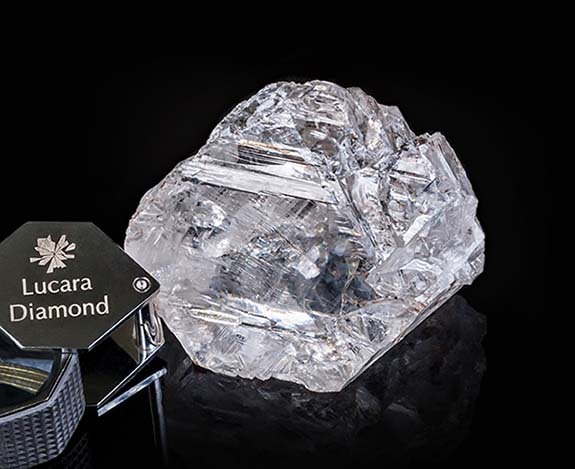 Back in June of 2016, Lucara Diamond Corp. was confident that Lesedi La Rona, which means "our light" in Botswana’s Tswana language, would fetch at least $70 million when it went under the hammer during a stand-alone sale at Sotheby’s London. The diamond went unsold when bidding stalled at $61 million. Then, in the summer of 2017, Lucara officials lamented that Lesedi La Rona might be "too big to sell" and contemplated slicing it into smaller parcels. At first blush, it appears as if Graff made a great deal at $53 million. 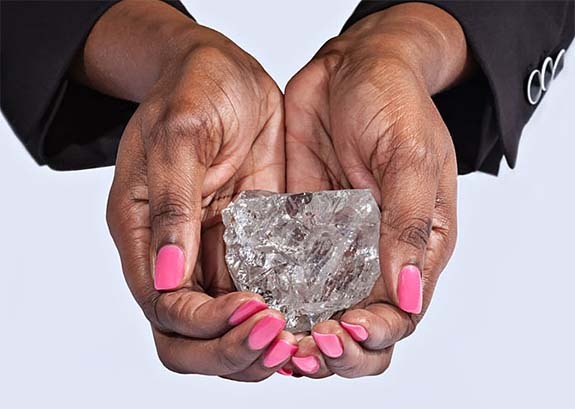 By comparison, the 813-carat Constellation — also sourced from Lucara's Karowe mine in Botswana and nearly 300 carats lighter — sold for $63 million in May of 2016. In fact, Lesedi La Rona, the Constellation and the Graff "chunk" were all found within 72 hours of one another in November of 2015. All three stone are rated Type IIa, the purest of all diamonds because they are composed solely of carbon with virtually no trace elements in the crystal lattice. Graff is no stranger to the world of magnificent diamonds. In 2006, he bought the 603-carat uncut Lesotho Promise for $12.4 million. Also among his treasures are the D-flawless 102.79-carat Graff Constellation, the 118-carat vivid fancy yellow Delaire Sunrise diamond and the internally flawless 23.88-carat Graff Pink. Credits: Images courtesy of Graff Diamonds, Lucara Diamond Corp.
Herman's Hermits were on the radio, Lyndon B. Johnson was in The White House and Audrey Musgrove was on her hands and knees looking for an engagement ring she would never find in the kitchen of her brand new home in Sully, Iowa. The year was 1965, and the young mom had taken off her bridal jewelry prior to mixing up a batch of cookies with her son. She had placed the rings against the backsplash, but when she returned later to retrieve the rings, the engagement ring was gone. If the ring had fallen from the backsplash, it had to be in the kitchen — somewhere — but despite hours of searching, Audrey and husband, Don, came up empty. She accepted the harsh reality that the engagement ring was likely gone forever. She did joke, though, that 100 years from now somebody would be tearing down the house and maybe they'd find the ring. More than 50 years passed and the Musgroves, in 2016, moved into a new Sully home more suited to their senior lifestyle. 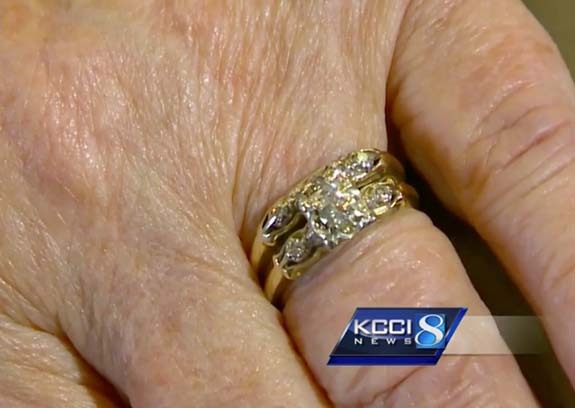 She has worn the wedding band every day for 59 years, but never replaced the engagement ring. Earlier this year, the new owners of the Musgrove home, George and Kimberley Mould, embarked on a total kitchen renovation. When they removed the island cabinet, a pristine engagement ring winked up at them. The startled homeowners contacted their real estate agent, who, in turn, tracked down the Musgroves. Audrey provided a detailed description of the missing ring, and the real estate agent confirmed it was hers. Audrey Musgrove is still having trouble wrapping her head around the fact that her engagement ring is back on her finger. “I still can't believe it and have to look at it every once in a while to believe it is really there,” she said. Credits: Screen captures via kcci.com. Welcome to Music Friday when we bring you fun songs with jewelry, gemstones or precious metals in the title or lyrics. Today, Karen Fairchild of Little Big Town demands an engagement ring and a walk down the aisle in the up-tempo 2010 country hit, "Little White Church." Fairchild portrays a young woman who is fed up with her boyfriend — a "charming devil" with a "silver tongue." He's been skirting a marriage commitment for far too long, and now Fairchild needs to lay down the law. From here forward, he won't be riding this "gravy train" until he buys her a shiny ring and takes her down to the little white church. She sings, "You've been singing that same old song / Far too long, far too long / Say you'll buy me a shiny ring / But your words don't mean a thing." Co-written by Little Big Town band members Fairchild, Kimberly Schlapman, Jimi Westbrook and Phillip Sweet, along with Nashville-based songwriter Wayne Kirkpatric, "Little White Church" was inspired by a phrase jotted down in Fairchild's notebook. Sweet told songfacts.com that a writing session turned into an avalanche of creativity when they started working on "Little White Church." "And it came together pretty fast," Sweet said. "Karen had the idea written in her book... because you drive around [Franklin] Tennessee and you see all these beautiful, quaint, picturesque, little white churches all over the place." Fairchild wanted the song to incorporate a bluegrass-inspired musical form called "call and response," which can be heard in the rousing "take me down, take me down" chorus. "Little White Church" is the lead single from Little Big Town's album The Reason Why. The song climbed to #6 on the U.S. Billboard Hot Country Songs chart and had crossover success on the U.S. Billboard Hot 100, topping out at #59. In the official music video, Fairchild portrays a bride on her wedding day. As she's walking on a country road toward the town's little white church, she's joined by her band members. Meanwhile, Fairchild's deranged mom gags her fiancé, ties him up and hides him in the trunk of a car. Written by Jimi Westbrook, Karen Fairchild, Kimberly Schlapman, Phillip Sweet and Wayne Kirkpatrick. Performed by Little Big Town.